One of the beauties of off-road is that the sport is accessible. Chris Pino has never had much of a dirt background aside from some local mountain biking. He has owned street bikes and appreciates a performance automobile, but a friend and former coworker found a package deal of two RZR 800s and a trailer. A year later they had driven the wheels off of the 800s and were feeling the limitations in power and suspension. Pino’s daytime job is highly demanding with rigid hours, and when his time to get away for roosting dirt comes, he wants to be ready and able to hit the trails. So, he decided to shop for a used Polaris RZR XP 1000 but wasn’t finding what he wanted. The numbers weren’t making sense. We found that the Hammer tires worked exceptionally well for packed surfaces like this trail. .com). 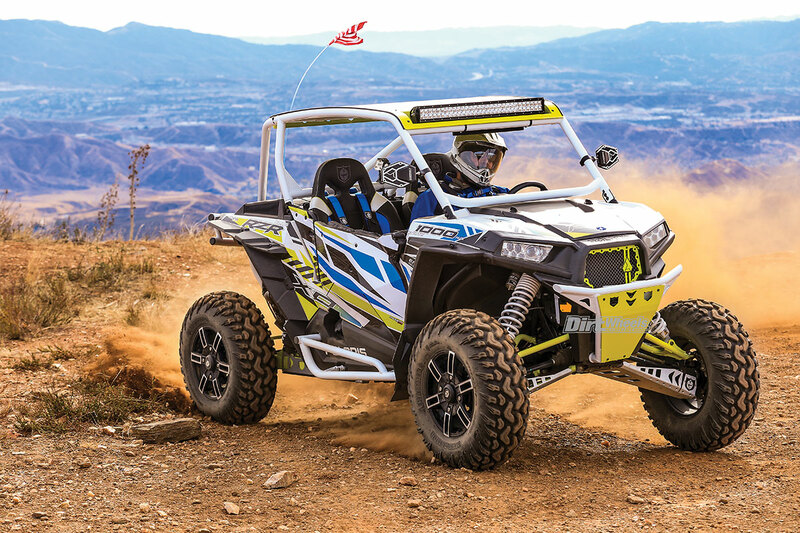 The owner had a brand-new 2017 Polaris RZR XP 1000 that was a dealer showpiece fully loaded with parts mostly from Pro Armor and Polaris with some from Assault Industries, Rigid and Rockford Fosgate. With his busy work schedule, he would have had to sacrifice months of driving outings to complete this build himself, and buying the machine complete added up to huge savings compared to buying the parts piecemeal. Believe it or not, when these photos were shot, the car was pushing 1000 off-road miles! We had the chance to drive it in the desert, the dunes and on mountainous rock trails. This is a truly nice machine. 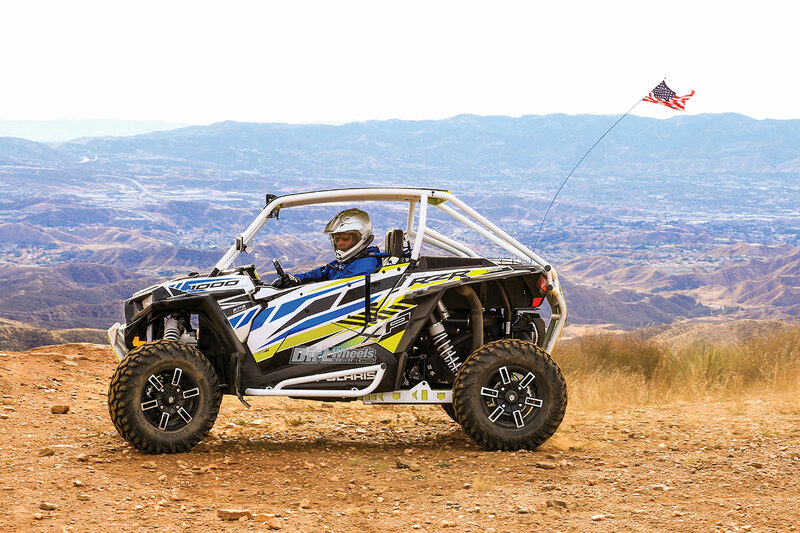 There is a reason that the RZR XP 1000 is Polaris’ best-selling sport UTV. Unless you are a serious dune hound, the XP 1000 is plenty of machine for most uses. 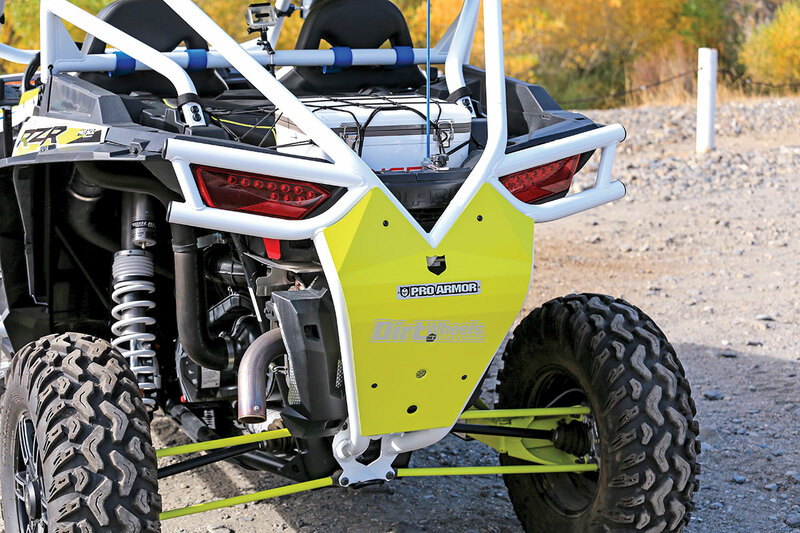 In every outing with this XP 1000, we had a Polaris Turbo along, and the going has to get truly wide open before the Turbo flexes its considerable muscle. For this build, protection is a big part—protection for the passengers and the machine. It started with a Pro Armor (PA) Asylum cage that lowers and streamlines the look of the machine. This cage was ordered in a custom white color, and it ties in with the rear bumper. A front bumper was added as well. The white parts already tie in well with the XP, but adding color-matched Lime Squeeze bumper skid plates and a roof make the XP stand out. The chosen roof has a pocket for a 30-inch Rigid E-Series LED light bar. Completing the external look of the car are white tubular rock sliders (PA has aluminum sheet sliders as well) and Polaris aluminum door skins. The skins attach to the stock door frames after the stock plastic covers are removed. Small covers are included to fill in the gaps left at the rear of the doors, and Proline Wraps has door graphics that match the stock graphics perfectly. It isn’t as easy to see, but there is ample protection for the suspension as well. There are aluminum PA guards on the front A-arms and on the trailing arms to keep them in good condition. A final exterior change is the Pro Armor tire and wheel set made up of Hammer 30×9.50-15 tires and Wyde Accent wheels. All four wheels come as a set, but in spite of being Pro Armor, they are only available from the Polaris accessory division. The wheels look great and are light, and the tires are amazing on packed surfaces and rocks, though they suffer a little in the sand and silt. Pro Armor seats, five-point seat belts and padded door bags all contribute to the safe, confident feeling this car imparts. Inside the XP are mods to protect and coddle the passengers. 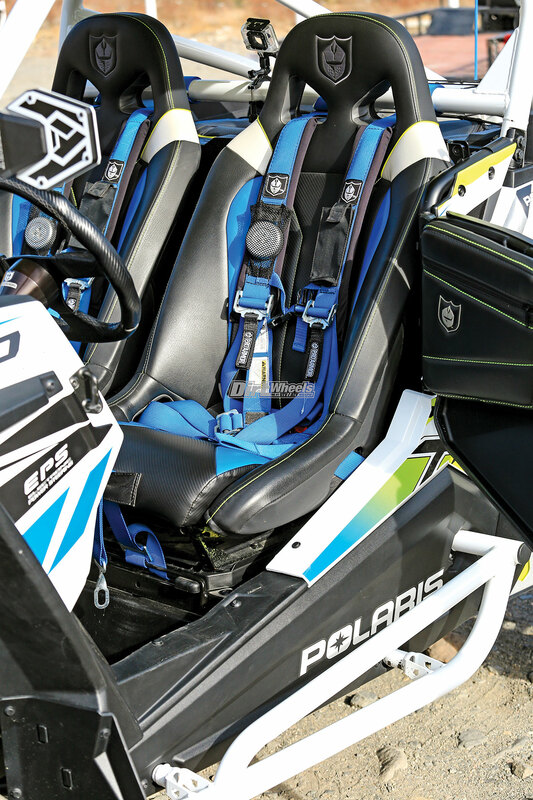 The luxury starts with PA G2 seats that are mated to 2-inch, five-point harnesses with sewn-on pads. Each belt set has a mesh pocket with a battery-powered LED light in it—handy! Stock Polaris doors are hard on the knees, but this XP pads the knees and adds storage with PA door bags. The bags still left a section of steel door frame exposed, so Pino covered that with foam pipe insulation from Home Depot. The final touch is a basic two-speaker stereo from Rockford Fosgate. Pino learned from his RZR 800 that ultimate power is not the most important aspect of off-roading. He opted to stay with the stock exhaust. It is quiet enough to reduce fatigue on long rides, is securely mounted and offers plenty of performance. He kept the intake and EFI stock as well. Most of his driving is on hard surfaces, so Pino’s search for performance netted 30-inch Hammer tires on 15-inch rims. The Wyde Accent wheels do not increase the offset, so the handling retains the stock character. The taller tires also have a normal feel, thanks to the jump to 15-inch wheels from the stock 14-inchers. It does have notably better ground clearance with the taller tires. There is protection in the front as well. 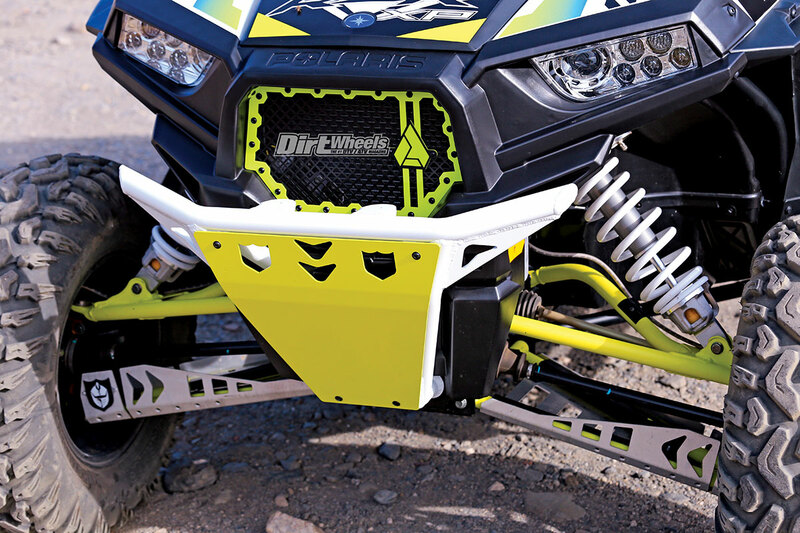 A sturdy bumper and lower A-arm guards stave off abuse. Remember that Pino and his friend had matching RZR 800s? Now they have almost-matching RZR XP 1000s. With all the added protection on Pino’s machine, there is a slight reduction in performance. Simply put, the protection adds weight. After the two discovered that there was a performance difference, Pino considered his modifications but couldn’t identify any of the protective gear that he was willing to part with to make the XP lighter. The difference is slight. In fact, when we were in the dunes, we fitted the XP 1000 with AMS Sand King tires and Roll’N 108 wheels. 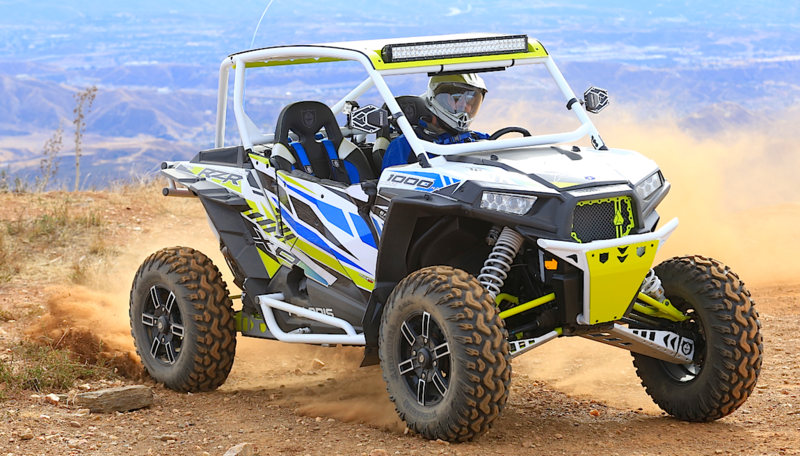 With the paddles, the XP 1000 was able to do rides with our 2018 RZR XP Turbo 4 Dynamix. 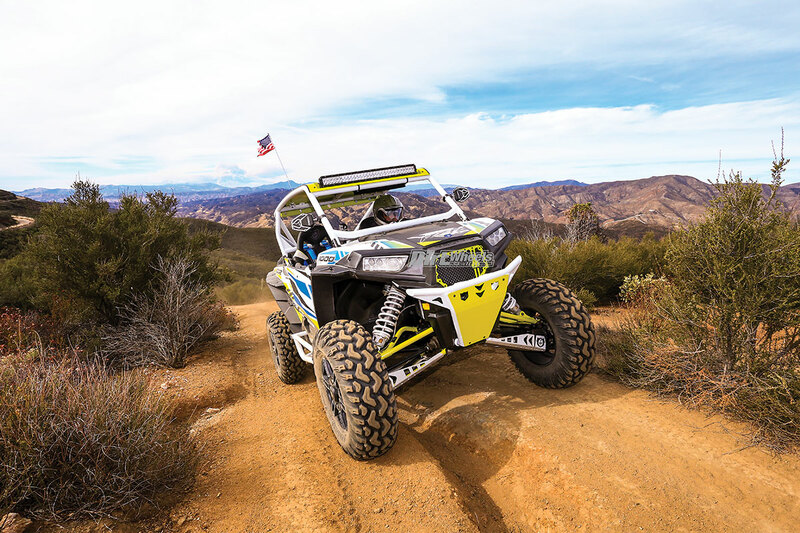 The Dynamix had brand-new stock Maxxis Bighorn tires that worked great in the sand. It was still more powerful despite being the four-seater, but the difference was not enough to change the dynamic of our group rides. Many of the trails and rides that Pino does are twisty and technical without much chance to fully exploit the top speed and high-speed handling. As a result, this car works just fine for its intended purpose, and there is no buyer’s remorse. The seats and belts are very supportive, comfortable and look great. The door bags and padding he added further boost comfort. He also runs a helmet radio for car-to-car communication, choosing to keep things simple. A beefy rear bumper is integrated into the Pro Armor roll cage to tie the whole car together. While there are no plans to boost the power, Pino has decided that his next move will be towards improved suspension setup and performance. He isn’t sure whether he will do springs and shock mods at the same time, but he knows that both are on the agenda in the near future. He’s heard that the suspension should be serviced at 1500 miles for best performance, so he will make his move on better suspension at the same time. In the meantime, the goal is to sample new and different riding areas. Simi RV chose the most popular upgrades to make selling this XP 1000 machine easier. As it turns out, there is a reason these mods are popular. They work, and they make the machine a more effective tool for off-road. These Polaris aluminum doors are actually a cover that replaces the plastic quarter door, but they mount to the stock door frame. ProLine Wraps makes the door graphics.